Price includes basic harness for homebuilt/experimental aircraft. Certified/production aircraft price is from $15,495 installed. With its 6.9-in. (diagonal) display, intuitive touchscreen interface and wide range of multifunction display capabilities, the GTN 725 is so much more than just a GPS navigator. 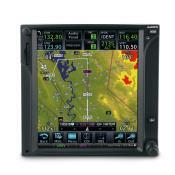 The 6-in.-tall system puts high-resolution terrain mapping, graphical flight planning, charting, traffic display, satellite weather and much more right at your fingertips. With the GTN 725’s revolutionary new touchscreen interface, you’re rarely more than two taps away from all of the system’s primary functions. Quickly pan across the map screen simply by swiping your finger across the high-resolution TFT display. Or enter waypoint data with the full onscreen keypad. It’s even designed with raised grips in the bezel and a shelf across the lower edge of the display that serve as gripping points in both smooth and turbulent flight conditions. Traditional concentric knobs are also available for those who are used to that style of data input. The GTN family makes it easier than ever to get where you’re going. Graphical flight planning capabilities allow you to edit your entire route on the map screen and easily enter new waypoints or modify existing ones. The system even lets you load Victor and jet airways. A handy "rubber band" feature lets you grab any leg of your flight plan route and move it to accommodate a deviation or ATC amendment to your flight plan. The GTN 725 also allows you to enter your most recently visited or nearest airports as waypoints or “Direct-To” destinations. Built-in Garmin U.S. FliteCharts™ or optional Jeppesen®-style geo-referenced ChartView™, provides you with approach plates and procedures, while Garmin SafeTaxi® lets you see geo-referenced runways, taxiways, FBOs and hangars. Packed full of multifunction display capabilities, the GTN 725 brings enhanced situational awareness to your cockpit. With high-resolution terrain mapping – including topography features, cities, airports, terminal areas, SUAs and more – and optional Class B TAWS alerting, you’ll find your way around the airspace safely and with ease. 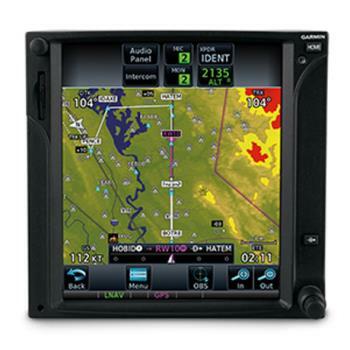 Couple the system with a GDL™ 69 series datalink receiver and XM® subscriptions, you can overlay NEXRAD radar right onto your moving map display and receive satellite music. Or add a Garmin traffic system and pinpoint other aircraft in your vicinity. The GTN 725 can even control the GMA 35 remote audio panel with clearance recorder, advanced auto squelch and more. Use the GMA 35 and a GTX™ 32/33 remote transponder to save up to 3 in. of panel space versus a typical GNS 430/530 install. The GTN 725 features a front-loading SD™ card reader, so you can easily update your databases. PilotPak™ database bundles are now available on a single aircraft basis, saving you money and simplifying the update process -- visit flyGarmin.com to learn more. GTN 725 is now available for purchase from your Garmin Authorized Dealer. See it in action at an upcoming seminar or in person at a demo dealer location.